Rosie Wardman joined our small animal team in September 2017 having previously worked in County Durham and West Fife. She works mainly between the St Andrews and Ladybank surgeries. 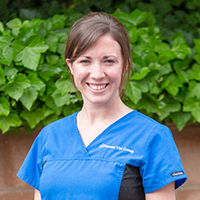 Rosie enjoys the wide variety that clinical work offers and has a particular interest in soft tissue surgery. She also enjoys treating the exotic and wildlife species that come through our doors. In her spare time Rosie enjoys horse riding, volunteering as a marine mammal medic for the BDMLR.